Standalone PC/OSX builds are pending. Kudos to Peter Queckenstedt (@scutanddestroy) for doing an amazing job on the Proctor, Hillary, and Trump. ​This has been a positive experience. I love games that actually have nontrivial interactions in them and completely open-ended text inputs. I'm a fan of interactive fiction, but hate that feeling when you're digging around and grasping for action words like some sort of textual pixel-hunt. The language processing systems in DS2016 aren't particularly complicated, but they're more simple than I'd like. In the first week of the jam I started writing a recurrent neural network to parse and analyze the sentiment of the player's comments. I realized, perhaps too late, that there wasn't enough clean data for me to use to accurately gauge the sentiment and map it to social groups. Instead, I wrote a basic multinomial naive bayes classifier that takes a sentence, tokenizes it, and maps it to 'like' or 'dislike'. Each group has its own classifier and tokenizer, so I could program demographics with a base voting likelihood and give each of them a few sentences on the "agrees with" and "disagrees with" sides, then have them automatically parse and change their feelings towards the player. A usability change that came in later than one would guess was as follows: I had originally grabbed the demographic with the largest emotional response to a comment and displayed them with the sentiment change. Unfortunately, this turned out to over-exaggerate one particularly noisy group. Another change, shortly thereafter, was masking the exact amount of the change. Instead of saying +1.05% opinion, it simply became "+Conservatives" or "-Hipsters". This was visually far easier to parse and I think helped the overall readability of the game. There is still a call to add some more direct public opinion tracking in the game, letting players know in closer to real time how they're doing among the demographics. I may find it in myself to introduce that. The last interesting aspect that I noticed during playtesting: I had slightly over-tuned the language models to my style of writing. Instead of opining on matters at any length, people were making enormous run-on sentences which appealed to every demographic at the same time. These statements, often self-contradictory, were not something I expected or handled well. I found the game to be rather difficult, but it looks like playtesters had a dandy time making the states go all blue. It's time again for Little Awful Jam! The theme is 'Weird History'. Make a game about folk lore, something strange that happened in history, or some corruption of events. This is my game design doc. 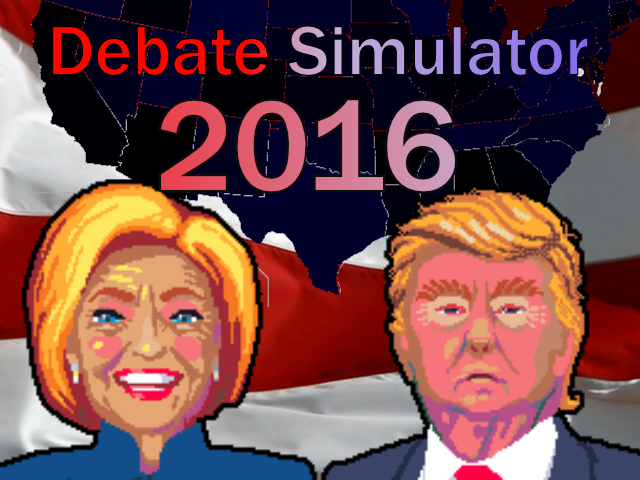 The Pitch: The idea on which I've settled is Debate Simulator 2016, where you play a presidential candidate stepping up to the podium to square off against our current commander-in-chief. The Gameplay: The gameplay consists of prompts and free responses. Your goal is to appeal to your voting base and to excite them enough to go out and vote. Alternatively, you can go 100% offensive and do nothing but verbally tear down your opponent. Your feedback will consist of your approval rating and your citizen motivation. Don't motivate people and they won't get out and vote, even if they like you. Motivate people to vote and don't get them to like you and you're sure to lose. The Challenge: Do you know your stuff? Can you overcome the Evangelical block? How do you tacitly approve of bodily autonomy without making it seem like you approve of bodily autonomy? Pick your alignment. Left-Democrat. Centrist-Democrat. Independent. Centrist-Republican. This will change the difficulty by having different demographic groups start with different opinions of you. End of game: show the election map and the polls. Use real demographic data to show how things played out. Generate realistic text for Donald Trump by randomly mashing together words. Simple NLP for the player to classify sentiment and subject, including prompt text for context. Look and Feel: 2D single-stage pixel art with largely static sprites and a camera that pans between the player and the challenger. Aiming for 640x480 resolution with 2x upscaling. No fancy particles. Minimal sprite talking animation. Animated text. Tools: Sadly, I won't be using Godot for this. Much as I love the engine, there is so much here that requires a more robust coding language that I need to do it in libGDX with Kotlin. Skeleton libGDX game with Kotlin. 'Hello World'. Scene stack and placeholder sprites. Basic game loop. Demographic data and player input processing + scoring. Opponent responses + emotional meter.